Vitalina Koval from Ukraine is one of those people who amaze you immediately with her bravery and resoluteness. Confident with who she is and what is right, she always gets straight to the point. When she tells you she wants equality for everyone in her country, she means it and is adamant on achieving it. "One day, I would like to see a Pride march in my home town [Uzhgorod, western Ukraine]", she says. Vitalina is openly lesbian and she coordinating the work of a community centre for LGBTI people in Uzhgorod which offers peer to peer support for LGBTI people. In March 2018, Vitalina was attacked for speaking up for her and other’s rights at a protest held on International Women’s Day in Ukraine. Six people from a radical group called "Karpatska Sich" doused her with red paint while she was participating in the event. The paint got into her eyes and caused chemical burns. "I've been attacked so many times but I'm not afraid anymore"
I felt pain, shock and fear: "I could go blind!". People tried to provide the first aid immediately. They gave me tissues, and water to wipe the paint. It didn't help. These long minutes it hurt and I couldn't get the thought that I could lose my sight out of my head. Fortunately, there was no permanent damage to Vitalina’s vision. From the hospital, Vitalina headed straight to the police station, still covered in paint. When she arrived, her attackers were sat by reception after being detained. The police officer made Vitalina state her home address – loudly - within earshot of her attackers. She felt scared and unsafe. When submitting the complaint, the police did not want to initially qualify the incident as a “hate crime” and it took several hours of insisting from Vitalina for her complaint to be registered accordingly in the police database. In the following days, Vitalina and other fellow activists, who participated in the International Women’s Day event on 8 March, observed the rise of threatening rhetoric by “Karpatska Sich”: the group threatened Vitalina and other activists with further violence on its social media pages. On 12 March, two of the activists who participated in the 8 March protest, but were not initially attacked, reported that they had been followed to their homes and beaten up by members of “Karpatska Sich”. "They launched a full-scale safari hunt on us," – Vitalina recalls. Fearing for her safety, she decided to leave Uzhgorod for a few days. 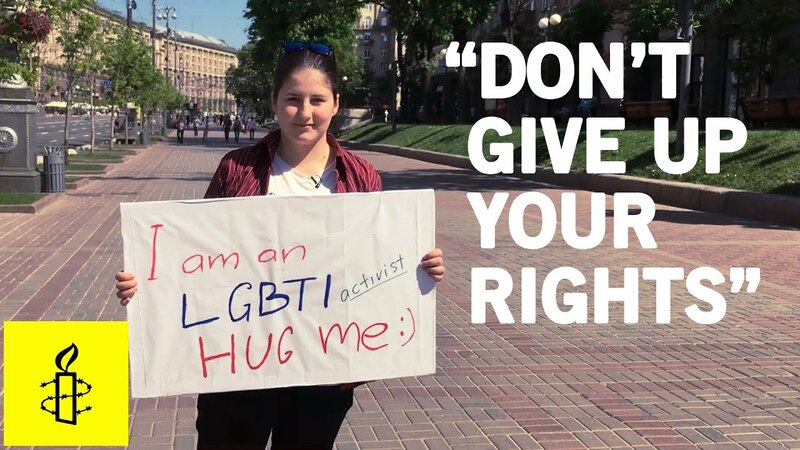 LGBTI rights in Ukraine: stopping halfway? Vitalina's situation is just one of more than 30 similar attacks documented by Amnesty International over the last 14 months. The reality of 2018 in Ukraine is such that the safety of an individual who chooses to simply participate in a feminist or LGBTI-related event is put at risk. Local far-right groups that portray themselves as patriotic and nationalist disrupt public discussions, threaten journalists and attack participants of public actions. And they do it with near-total impunity. Out of dozens of recent attacks only one was brought to court. It would be fair to say Ukraine has made a significant progress since its first ever "Kyiv Pride" march in 2013. From being a marginal gathering of 50 people, on the outskirts of the city, the event has grown into one that attracts thousands of people in the city centre – and not without the unprecedented measures of protection from the authorities, such as large police presence and even Kyiv’s metro providing trains for the safe evacuation of everyone leaving the event. However, this progress is fragile and the authorities' failure to address the problem may undermine everything that has been achieved so far. The attack on the 8 March IWD protest, as well as the "safari" that followed, shook up Uzhgorod. The town has always been a home for people coming from diverse ethnic backgrounds and cultures. This is something that Vitalina always believed in and that is why she has decided to fight back. In response to the attacks and barrage of threats, Vitalina decided to organize a public action, "For European Uzhgorod! Against the impunity of the far-right" to stand for the right to peaceful assemblies and freedom of thought. "I'm not going to tolerate violence against me in any form," – she wrote on her Facebook page. I wouldn't fight if I and my friends weren't attacked, if I weren't threatened. The day of the action was tense. Many people who agreed to join pulled out at the last minute because of the barrage of threats they were receiving. A counter-protest was organized on 31 March. The event was successfully protected by the police, who separated the two opposing camps (event participants on the one hand and far-right protestors on the other) with a cordon. "I hate it that there needs to be a cordon to ensure my safety. I would want to stand free at the square and being heard by my opponents. I wish the far-right assault on peaceful assemblies could be stopped." Vitalina stepped out on International Women’s Day 2018 to attend a peaceful protest. But she was met with violence, and came home with chemical burns to her eyes. Vitalina is a determined activist – but she is at risk and needs your support. Send a tweet to Ukraine’s Minister of Interior, @AvakovArsen. now, calling on him to ensure hate crimes like the one carried out against Vitalina are effectively investigated & prevented!
. @AvakovArsen, stand against hate crimes and protect activists like Vitalina Koval in #Ukraine. #IStandWithVitalina, do you?